The Dawn Jogger is glad someone has something to celebrate. 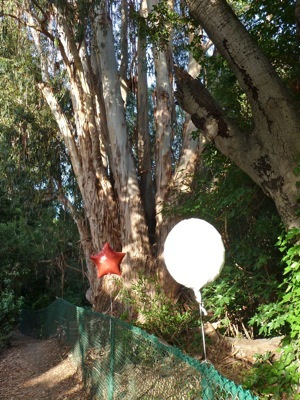 She noticed the balloons lining a stretch of fence along San Francisquito Creek during her dawn outing this morning. But celebrating she is not, given the news that Buster Posey is out for the season. There’s been a lot of chatter in the press about how dangerous playing catcher is and that the Giants management should move their valuable future face of the franchise to another position. That will now only increase post last night’s collision. In an irony of sorts, she’s headed up the Yard today for a day game.. This entry was posted in Dawn jogging, SF Giants. Bookmark the permalink.